Continuing on with my quest to learn Moho Pro 12. Can I get through the final twelve advanced tutorials this post? Will I make a start on the final run of 'What's New in Moho Pro 12?' tutorials? Can you believe my attention span has lasted this long - oooh shiny! The list below are the tutorial titles that I've completed for this post and my summaries of each follow after that. Blend Morphs are a relatively quick way to apply smooth transitions between two action states of various vector points. For example, say you have a character facing directly toward the camera. 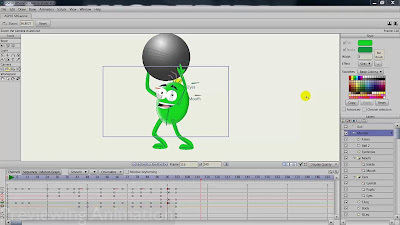 By creating an Action of the character with the head turned to the left (using only existing points from the facing forward image) you can create a blend morph between those two states, facing forward and looking to the left, that can be applied any time you like within your animation. By adjusting the blend morph slider for that action the character will smoothly animate between the two states as much or as little as you need (so you could do a slight turn to the left instead of a full turn). 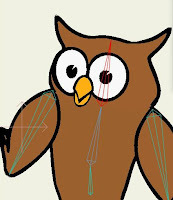 Flexi-Binding is a bone rigging method that appears to localize bone strengths so that you don't get unwanted distortions in your image when moving bones around. For example if you have a character rigged up but haven't bound any individual part to specific bones, when you move a leg, the body and other leg may smear and distort dramatically. Flexi-binding appears to fix this but I wasn't really sure how, as the tutorial example didn't show if its character was all on one layer or had its body parts divided among different layers. the custom green shape beneath them. The Particle Source Tutorial seems to assume prior knowledge of how Moho's particle animation has worked in the past, yet, to this point, this is the first tutorial I've encountered that even mentions it. Fortunately there is enough information within the tutorial to set up your first particle layer and experiment with the settings. Nothing really too complex here. If you wanted to animate a character throwing confetti, a particle layer is the tool for it. Pretty much any image can be turned into a particle and animated by adjusting settings. It also shows how you can turn any shape into a source area for you particles to appear from. 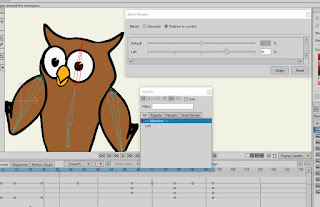 The Real Time Media Connection tutorial demonstrates how Moho keeps track of the source files you import into the studio, detects any changes to them in real time and updates the imported file accordingly. For example, say you've imported a Photoshop image into Moho. You then open the source file for that image in Photoshop and recolor it, then save it back to the same file. Moho will detect that change and update your imported image to reflect the new colors. The Scripts tutorial draws your attention to the Scripts menu where you can apply all kinds of pre-made scripts to your animation simply by choosing the option you want. There are various effects to explore. The tutorial also shows where you can get more user made scripts and how to install them. Writing your own custom scripts is probably more advanced than you'll ever need whilst learning the software. However essentially you can write a script to automate an often used process through to changing how the program actually works. The Onion Skinning tutorial is just a quick rundown of improvements made to the onion skinning feature such as, fading frames as you get further away from the current frame and being able to view you designs in full color, not just outlines. In the Preview Animation tutorial we get a demonstration for how you can quickly render out your animation to a video file for proofing before doing a final render. This preview is at the same quality as you'd see if you play your animation back directly in the studio but won't be burdened by memory or lagging issues if you're working on a particularly complex sequence. The tutorial also shows how to preview just a section of your animation too. The Advanced Importing tutorial runs you through some of the pre-installed content that you can access through the File > Import menu. There's quite a bit of content here to explore. It also shows you how to import things directly from other projects or many types of custom file. Importing PSD's is a tutorial specifically detailing how to import your Photoshop images so they retain the same layers if that's what you need. The tutorial also gives you a quick demonstration of simple rigging of a character... in case you've forgotten. The Advanced Exporting tutorial is fairly self explanatory and runs you through all the options of exporting your work to various file formats for publishing or importing into your preferred video editing software. Watch this if you need a refresher course on exporting. The GPU Acceleration tutorial outlines a new display feature that enhances your images/scenes and gives you a better representation for how they will look once exported. It's something to keep in mind as an additional tool to utilize, particularly if you're creating complex scenes. The last tutorial in the Pro Series (YAY!) is called 'Step By Step' and runs for nearly two hours. It basically takes you through the entire process of animating a scene from scratch (i.e. a completely new and blank work space). It begins with drawing a simple character with full use of many of the rendering and color tools, runs you through rigging and animating the character, adding a background and more. It's actually a really good tutorial if you haven't used Moho for a while (or you're burnt out from marathoning all the other tutorials) and just need a refresher on most of the key features. I'd recommend following along but creating your own animation as you go. I must admit I found it to be very useful for reminding me of things from earlier videos. 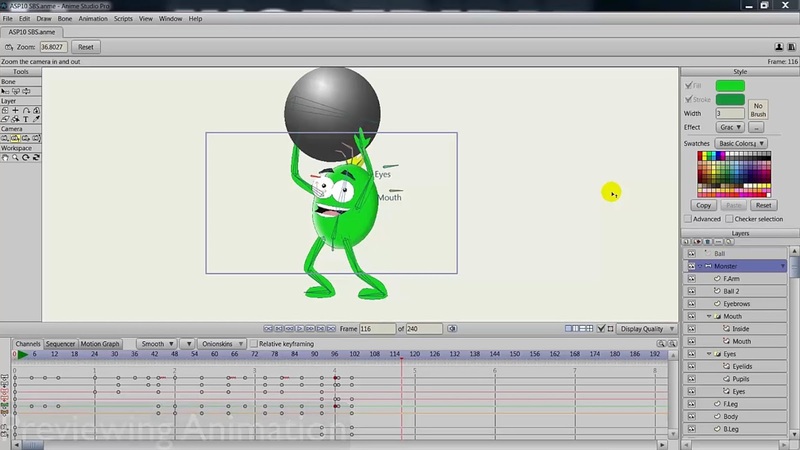 drawn, rigged and animated to lift a ball with sound effects. That completes my run through of Moho Pro's Advanced Video Tutorials. 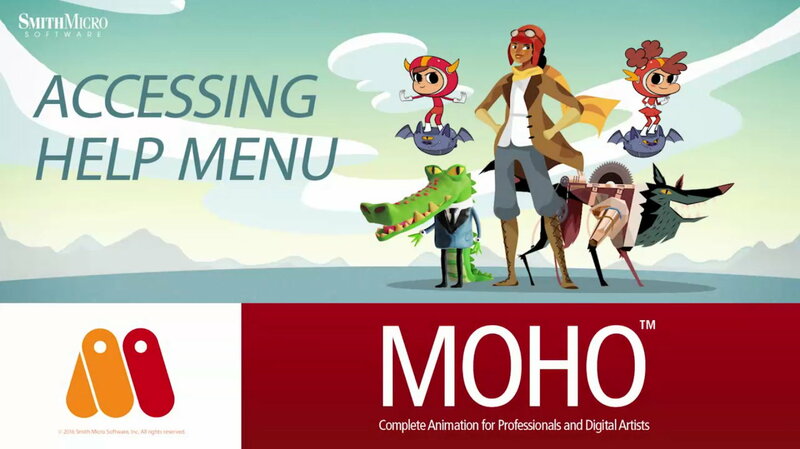 All that remains now is to run through the remaining 18 video tutorials outlining all the new features of Moho 12. Can't wait..... *sigh*. Depending on how long each video is, I'll try to get through them in no more than one or two additional posts so I can finally talk about something else, like maybe using Moho to create an actual project of my own. Continue on to the next post.